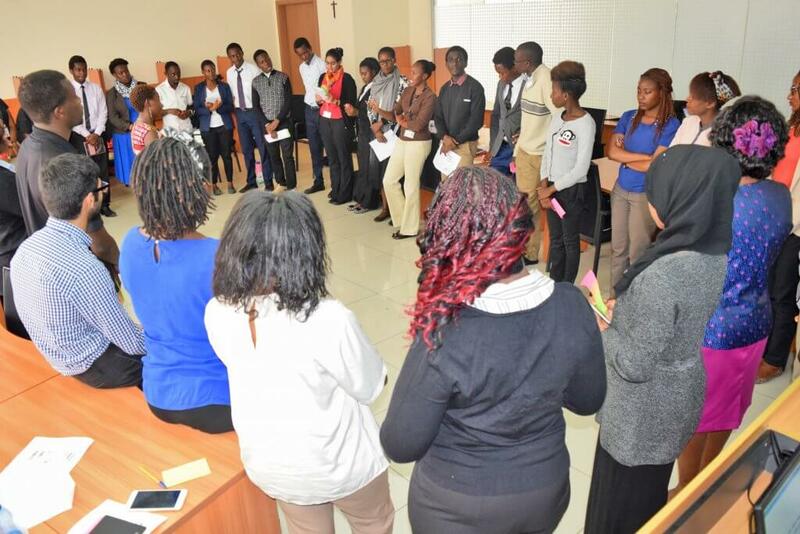 Strathmore University, 28 October 2016 – Over 35 Strathmore University students gathered at the Strathmore Business School for the World Climate Simulation organized by the Strathmore Center for Sustainability Leadership and the Strathmore University Student Council in partnership with Climate Interactive. The event aimed at increasing interest in and mobilizing youth participation in the climate change issues embodied in the game. With the majority being law, finance, business and IT students, the participants reported having general knowledge of global warming issues but were not aware of the magnitude of the negative consequences presently being faced, with worse possibly to come. The event began with an introductory lecture by Mr. Stephen King’uyu from the Kenya Climate Change Directorate at the Ministry of Environment and Mineral Resources. As among the most vulnerable continents to climate change, he described the current situation in Africa and Kenya, and the impacts that have been scientifically observed. Africa is already experiencing a reduction in agricultural productivity, increasing water scarcity, more frequent and severe drought and floods, loss of biodiversity, and a rising chronic burden of disease. These challenges further come with economic costs given that the continent heavily relies on natural resources and where just below half the total population live below the poverty line. Nevertheless, Mr. King’uyu emphasized that through mitigation activities and creation of awareness to encourage widespread public participation, we are actively combating these issues. He demonstrated some of the responses in various countries, including the adoption of the Climate Change Act in Kenya (the first country to do so in Africa), and the implementation of renewable energy projects. After this priming session, the room was rearranged to start the World Climate exercise. Participants took seats (and floor space for the developing countries) in their respective negotiating parties from the six regions. Two groups were made up of Climate Activists and Fossil Fuel Lobbyists. Grace Mwaura from Climate Interactive provided an overview of the format of the negotiations process and the C-ROADS simulator. Delegates were also given guidance on formulating their negotiating strategies. Taking on the role of UNFCCC Executive Secretary, Ms. Sheila Mbiru from the Low Emissions and Climate Resilient Development Project at the Ministry of Environment kicked off the first round of negotiations. Sheila, who co-facilitated the event, invited delegates to debate on emission reduction and afforestation targets, and agree on their contribution to the green climate fund. This was within consideration of their current socio-economic contexts and with the overall goal of ensuring global warming remains below 2°C. The Climate Activists and Fossil Fuel Lobbyists circulated the room influencing the negotiating groups. After a relatively diplomatic round, the parties were called to declare their policy plans. However, after inputting the data into the C-ROADS software, global warming had risen to 2.6°C by 2100. Falling short of the target, the UNFCCC Secretary reiterated the real-world implications of failing to keep global warming between 1.5°C and 2°C and called for the delegates to make more substantial commitments. Faced with these factual consequences, delegates launched into further discussions in their respective blocs. Contrary to what was expected, the second round of negotiations did not take a more conciliatory tone. Parties begun to challenge each other on the Nationally Determined Contributions (NDC) proposed. Discussions became confrontational when some developed nations refused to contribute more to the Green Climate Fund and decrease their emissions further. It was during this round that the dynamics of international negotiations within and between countries and regions became more observable. After entering the new policy plans, the second round resulted in a global warming of 2.1°C. With the 2°C target nearly reached, the debriefing session provided the opportunity for participants to step down from their delegate roles and as individuals, share their perspectives on the negotiations. What came to the forefront was the fact that climate change agreements are a deeply political issue, magnified by the inequalities among countries and evident during UN policy making processes. Participants better understood why the Paris Agreement from COP 21 and the adoption of the Sustainable Development Goals (SDGs) were such defining moments for global cooperation to tackle climate change and pursue low-carbon, inclusive development. Furthermore, the fact that young people, who make up a majority of the global population, will be most affected and at risk became more tangible. Participants reported feeling frustrated and burdened. However, they were also very hopeful and optimistic that it presents an opportunity for the youth to catalyze and take over the response to climate change and sustainable development. In closing the participants were invited to share ideas for action, both at the individual and institutional levels. All agreed that creating greater awareness about this issue is of upmost importance. Many students felt that the topic is too important to be separated from programs being run at universities. They called for the integration of sustainability and climate change education into the curriculum to ensure that the workforce is composed of sustainability influencers. Further, they called on to the mainstream media to utilize their position to enhance climate change knowledge among the general public. However, as major players in social media, they agreed that they can utilize these platforms to spread greater awareness. The participants also highlighted the need for greater inclusion of youth in global and national negotiations. Students also challenged themselves to seek ways of contributing towards sustainability through their professions. 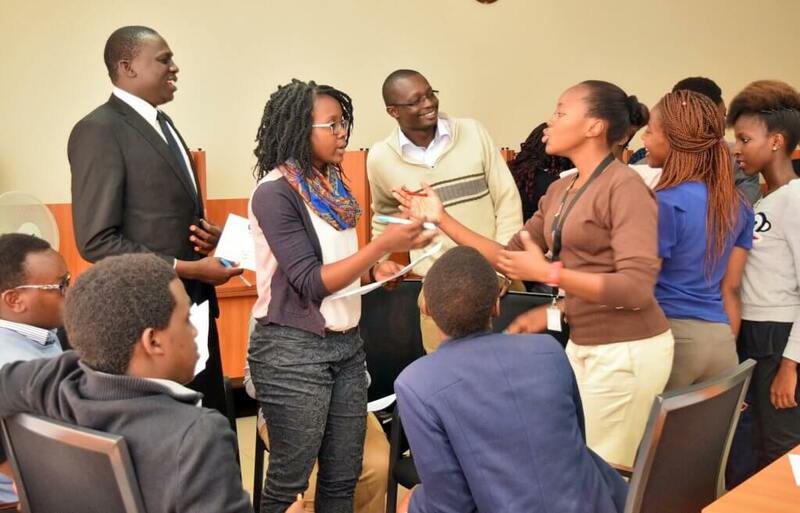 Law students were interested in translating Kenya’s Climate Change Act into actionable issues. Students pursuing IT related programs committed to developing technological solutions to climate change. At individual levels, participants stated that they would be more environmentally conscious such as through recycling more, preserving energy, and participating in environmental protection activities (e.g. tree planting).